The Hanseatic City of Lübeck was leading among this league of merchant cities which held a monopoly over the trade of the Baltic Sea and the North Sea. The functioning of the Hanseatic League is not only proof of early economic co-operation in Europe, but it also founded a social and cultural community which has left its mark throughout the region, particularly in the self-contained architectural world of brick Gothic. the Burgkloster, Koberg and sections between the Glockengiesserstrasse and the Aegidienstrasse. the patrician residences between the Petrikirche and the Dom, the salt storehouses and the Holstentor. the heart of the city, with the Marienkirche, the Rathaus and the Marktplatz. 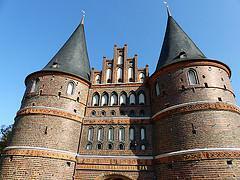 Lübeck was only reluctantly admitted to the World Heritage List. Its nomination was deferred the first time in 1983 because of the loss of authenticity the city suffered from reconstruction after World War II. The ICOMOS advice at the second attempt (in 1987) also holds more warnings than admiring words. 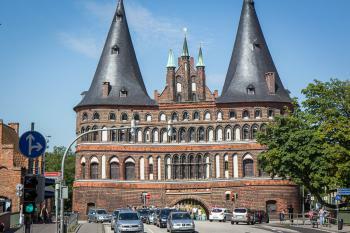 The site is also similar to the nearby Hanseatic cities of Stralsund & Wismar, and a serial nomination was recommended. I visited Lübeck on a very cold Saturday in December. 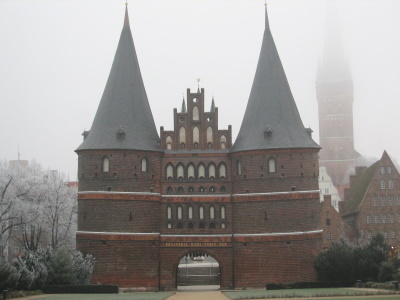 The picturesque Holstentor is the gate to the city center, with the salt storehouses right next to it. 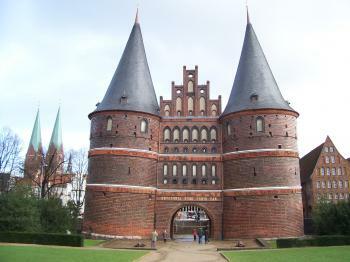 The gate now houses the municipal museum, where one can see how Lübeck looked like before WWII. Wandering around the city's old quarter I'm afraid I have to agree with the sceptic ICOMOS-people: the fabulous remaining monuments are almost hidden from sight by ugly modern constructions, parked cars, cheap shops and eateries and (at this time of year) Christmas stalls. Lübeck's monuments are heavy on a style called "Brick Gothic", originating in countries in which there was a lack of natural stone. I was a bit surprised that Lubeck wasn't included as a single site with Wismar and Stralsund - there are a lot of similarities and such a common history. But, regardless, I found it an interesting place to visit. I note some previous comments about the encroachment of development and reconstruction, however I found the individual buildings to be quite impressive when viewed in isolation. There is a good breadth of architectural styles and periods represented by the main buildings on the island. It certainly, however, feels like a relatively modern city with a few patches of history still within it - and that gives it a slightly different feel to the aforementioned cities, which I felt still had more of a traditional Hanseatic feel to the old centres. Incidentally, Lubeck is actually quite a nice place to spend a night or two and relax and I enjoyed wandering around and spending some time by the river. I visited this WHS in October 2014. I spent a night here and explored the sights over 2 days. 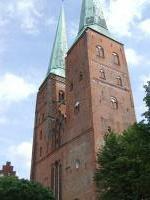 The main landmark is the Holstentor and there is a twin steepled church and a tower nearby. When walking close the Holstentor you'll immediately notice that it is leaning and also somewhat subsiding too. Still it is well kept and the red brick details worth viewing in sunny weather conditions. In the morning the sun shines on the rear facade of the Holstentor and on the nearby historic salt storehouses. The old city centre houses beautiful red brick buildings such as the Rathaus, St Jacob Church, the Burgtor which are worth viewing. It's true that there are quite a lot of urban constructions but I still loved what Lubeck had to offer. The Café Niederegger is worth visiting even if only to see the marzipan heritage sites inside. Behind the Café Niederegger, there was an Oktoberfest celebration with delicious Bratwurst and beers being served so I joined in gladly. I really enjoyed Lubeck and I must say that it is also one of my favourite WHS in Germany. I was born in Luebeck many years ago. I visit on the internet now and then.Luebeck was bombed during the war and had no choice but to rebuild. A lot of the old building were no longer standing. Of course if one rebuilds it will look new. I find this aspect so wonderful. Old and new live in harmony. After all it is 2013 and time and technology changes. Hope every one has a wonderful time in Luebeck. Appreciate the "old" and marvel at the new. The town should not be in a time-warp. Have a nice day. I visited Lubeck after visiting Wismar and Stralsund, and was disappointed at the rampant disregard for its heritage evidenced by all the modern steel and glass construction. Even the majestic Holstentor was not enough to warrant OUV. The interior of the Petrikirche had been destroyed by being painted white, while that of the Dom had been modernised quite out of character with its red brick exterior. I visited Lübeck to celebrate the New Year 2006/7 and had a really lovely time. It was great to see in the New Year on the banks of the river with fireworks going off all around us. I also have a real love for red brick buildings and cobbled streets so I was very much in my element here. The most famous Building is the Holstentor (picture) and this is a great way to enter the city, it is quite noticeably leaning. It used to be on the 50DM note, and can now be found on a limited run of €2 coins. The Historic Centre of the city is situated on an island behind the gate. There are a fair few large churches in the centre; Marienkirche (twin spires in the left of picture) was the most impressive. It was huge inside, much larger than I thought it would be. We were very lucky to be able to attend a special Sylvester Concert of Handel’s Messiah inside on New Years Eve, which was a real treat. There are a lot of areas with lovely red brick buildings all through the centre, but it is also quiet spoiled by some very poor town planning in the 1950/60’s especially on the Altermarkt. The once open square has been enclosed by some really unnecessary buildings, which on the south side seem to be offensively bland. However the newer developments can’t hide the undoubted charm of the city. Not to be missed is Café Niederegger, which is famous for its Marzipan. The shop is like something from a movie. There are also displays of famous people/ buildings made of Marzipan, including a few World Heritage Sites. Lübeck is situated in Northern Germany about a 45-minute train ride from Hamburg, which is well worth a visit. Also nearby is the WHS of Wismar, for once I didn’t make a short trip to add to my collection, but had I had an extra few hours probably would have done. Lübeck is a really lovely city, which still has lots of charm despite some misguided development. Well worth a leisurely weekend. As a Hanseatic town Lubeck resembled to me my hometown - Riga. City definitely is attractive, dominated by red brick structures, incredibly high churches. It seems that World War II and the later prosperity have diminished the charm of this town, but it is worth the visit anyway. Historical Organs: Arp Scnitzger's famous organ at the cathedral was lost in WWII and reconstructed since. 265 Community Members have visited.